(l-r): Michele McKenzie, Mike Wilde, Yobany Castro, Terin Mayer (back row) and Edaurdo Ramos. At 7:30 am on January 22, Minneapolis City Council Vice President Elizabeth Glidden and staff hosted a roundtable conversation with the public as one of the monthly Early Mornings with Elizabeth meetings. Though meetings are for members of the 8th Ward in particular, they are open to anyone interested in the topics up for discussion. These events are held at the Turtle Bread Company, 4762 Chicago Avenue in South Minneapolis. The January meeting focused on wage theft, which is the failure by an employer to properly pay workers an agreed-upon amount of money for time worked. Despite many laws that prohibit wage theft and direct how and when employees are paid, workers still regularly experience wage theft in Minneapolis and around the country. Glidden invited three individuals to participate who represent organizations that advocate for workers who fall victim to wage theft. Approximately 45-50 people attended. Terin Mayer, an organizer with Centro de Trabajadores Unidos en Lucha (CTUL) — in English, Center for Workers United in Struggle — described CTUL as a nonprofit organization that supports the leadership development of workers and their rights to advocate for themselves on the job. 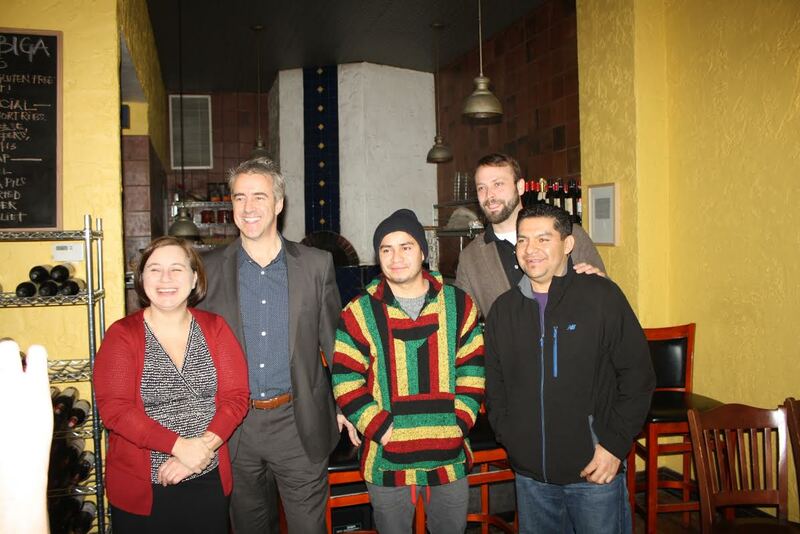 Two Spanish-speaking workers, Eduardo Ramos and Yobany Castro, accompanied Mayer to tell their personal stories about wage theft in the Twin Cities area. Mayer served as their interpreter. Ramos said that he was cheated by a contractor, took the business to small claims court, and won a judgment against the employer. The problem, said Ramos, was that each time he tried to get his money, the business owner would change the name of the company. Ramos is still seeking compensation. Castro experienced wage theft while working as a roofer for three different Minneapolis-area contractors. His first employer agreed to pay him $700 every 14 days. However, he worked 12-hour days, more hours than Castro originally expected and understood. He described roofing as very dangerous work but pointed out that the risk to the worker did not matter to the contractor. The pay never exceeded $700 every pay period, which was the equivalent of about $4.16 per hour, or $50 a day. Castro decided to leave the job, and according to him he was cheated out of about $1,800 dollars, which he has not yet received. Mike Wilde is an attorney and executive director of the Fair Contracting Foundation (FCF). “So many contractors are cheating their employees out of wages,” he said. The laws and standards have been on the books for decades, but who is in political office determines if enforcement takes place. “The good news is that from 2011 through 2015, FCF assisted workers in the Twin Cities area with getting their wages to the combined total of $325,561,” said Wilde. He also predicted that in 2016, the FCF will collect, on behalf of victims of wage theft, over $1,000,000 in stolen wages. One of the things they are working on first is fighting human trafficking, because, according McKenzie, 80 percent of the victims of human trafficking involving labor are also victims of wages theft. Advocates for Human Rights focuses on worker solidarity through educating them about their rights. One of the recommendations from Mayer of CTUL was to push for ordinances that would penalize licensed employers by revoking their license for violating prevailing wage laws. CTUL presented findings of the organization’s recent survey and report on conditions faced by low-wage workers. Entitled “Confronting Exploitation,” the report is available online at their website: www.scribd.com/doc/289479974/FINAL-Confronting-Exploitation-CTUL-Report-on-Low-wage-Economy-English-Spanish-for-Print. Those who have been victims or know someone who has been a victim of wage theft and would like to learn more about it can contact the office of Eighth Ward City Council Vice President Elizabeth Glidden at 612-673-2208. James L. Stroud, Jr. welcomes reader response to jlswriter@gmail.com.